Japanese Dining SUN has been around since 2005 and it is a place that holds special memories for me because I celebrated my 1st Valentine’s Day there! I was young then and enjoyed the romantic evening very much! Since then, I’ve always had a soft spot for Japanese Dining SUN, also partly helped along by the fact that one of my friends used to be the manager there. So I was pretty delighted to be invited for a food tasting to try out their new Kyushu Experience promotion. 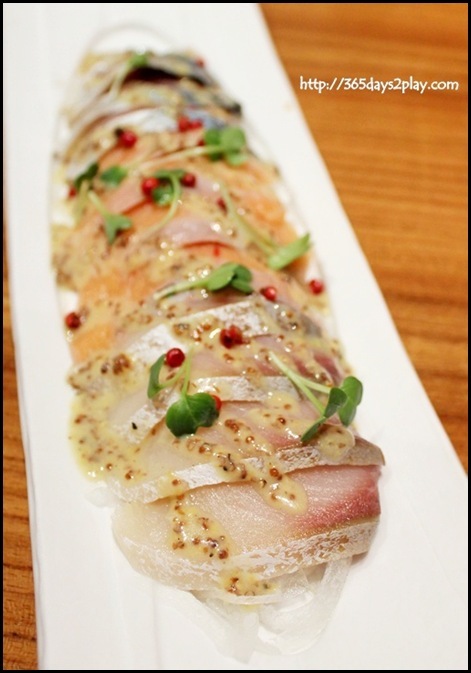 Japanese Dining SUN (Chjimes) & Sun with Moon (Wheelock Place) is working in partnership with the Fukuoka Chamber of Commerce and Industry to launch the Kyushu Experience. The Kyushu Gourmet Experience will introduce not only regional cuisine from the Kyushu prefectures of Miyazaki, Fukuoka, Saga and Oita, but also feature authentic ingredients air-flown in twice weekly especially for this menu, such as Miyazaki Wagyu, Koji Salt, Kyushu Sashimi etc. 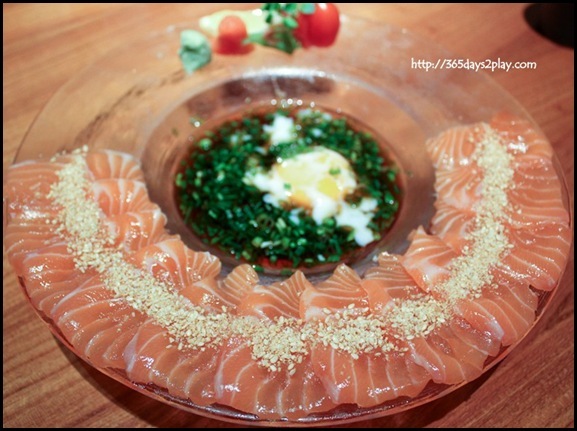 Oh, another favourite for me, salmon sashimi with soft-boiled egg! The salmon sashimi was fresh tasting, and for $15.80, quite a generous amount of sashimi was provided. To perk up the dish, we were treated to a soft-boiled egg floating in special soya sauce that was on the sweet side. I have to apologise to my fellow diners because I must have grabbed more than 1/2 the egg. You know how I love eggs in most forms (except hard-boiled). Definitely a must order if you’re going to try out the Kyushu Experience! Did you check out the Canada Food Fair that just ended? 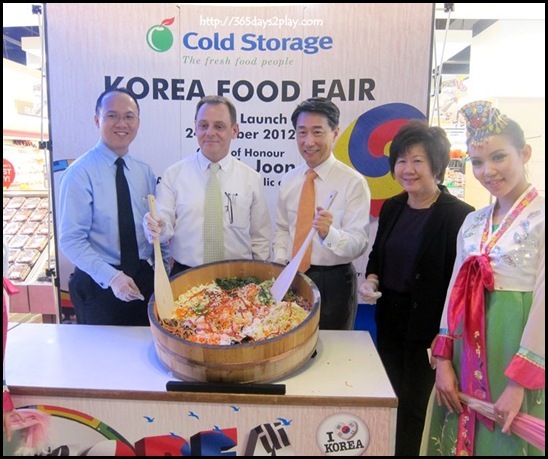 If you enjoyed that, you will be happy to know that Cold Storage will be having its inaugural Korea Food Fair which will be held for three weeks from 25 October to 18 November 2012 at all 49 Cold Storage stores. With support from the aT Korea Agro-trade Centre, the delicious fare from this popular Asian destination will be showcased with an extensive selection of almost 100 lines of fresh produce and delectable food products specially brought in to cater to discerning Cold Storage shoppers. Thanks to K-pop and K-dramas, Korean culture has become known around the world. Win a Holiday to Korea! 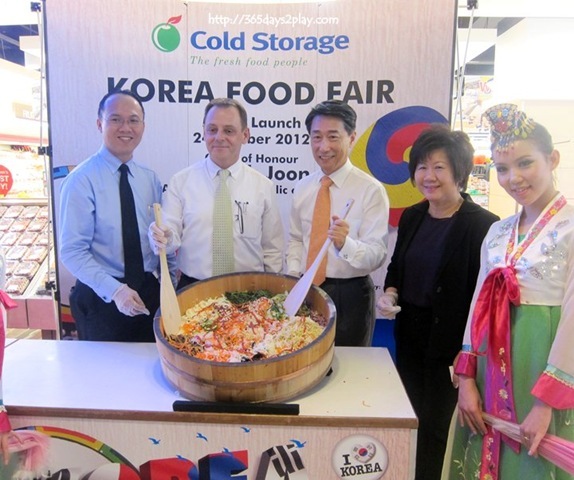 At the end of the fair, ONE lucky Cold Storage shopper will walk away with an eight-day Korea holiday worth $5,000 for two. To qualify for the draw, shoppers simply need to spend a minimum of $35 in a single receipt (inclusive of two Korean products). 50 consolation prizes of HappyCall Cookware Sets – a well-known brand from South Korea – worth $218 each will also be given away during the draw. Bi Bim Bap, elephant size! 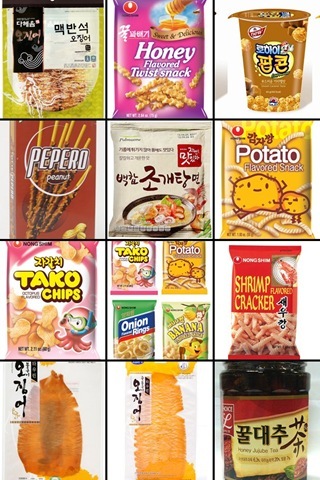 Here are some Korean snacks that you may or may not have heard before. I think most people are more familiar with Japanese snacks. I’ve never actually seen so many Korean snacks, or perhaps never really paid attention to Korean snacks until now. When Dream Academy invited me to watch this upcoming musical, I was quite delighted. I did a quick calculation and realised that the last time that I have watched a theatre performance was back in 2007! It was a Crazy Christmas, held at the National Library Drama centre and I enjoyed the performance tremendously! To think that during my younger days I was Chairperson of my school’s English Drama Society. How terrible that I’ve totally lost touch with the ins and outs of our local theatre circle! Anyway I’m really looking forward to watching Company, the musical next Friday! I’ll do up another post once I’ve watched the musical. Dream World Productions presents its first production, COMPANY by the legendary Mr. Stephen Sondheim. COMPANY has won a total of seven TONY Awards, including Best Musical, Best Book of a Musical, Best Original Music and Best Original Lyrics in the 1971 Original Broadway production and Best Revival of a Musical in the 2006 Broadway Revival. Hossan Leong is the director for the Singapore version of Company. This super-funny musical comedy explores the pros and cons, the ups and downs as well as the ins and outs of being single. Join our talented cast as they try to persuade our hero, Robert, to do what our Government has been hard selling for years… Get married! Check out the teaser videos! 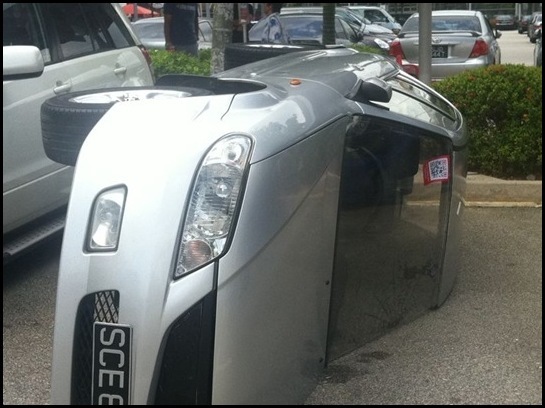 SISTIC Hotline: (65) 6348 5555 and SISTIC Authorised Agents islandwide. There are precious few vegetarian restaurants around, much less those which are good. I’m so glad to report that one such vegetarian restaurant exists and it is located in the East, specifically East Coast Road! It’s the row of shophouses just opposite 112 Katong, but for some reason, I always walk past it without noticing it’s there. 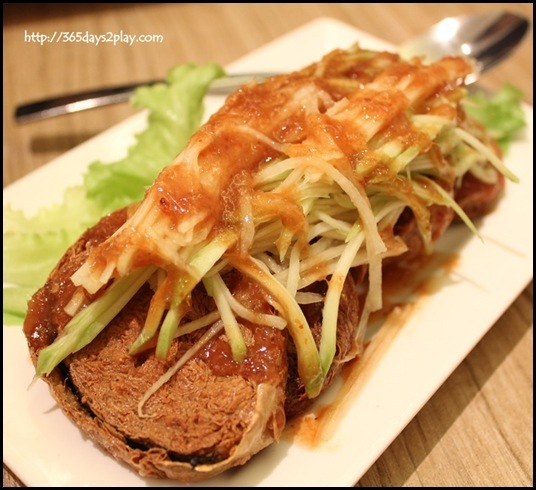 There are a lot of nice eateries located along that stretch, ranging from Peranakan to Indian, to Vegetarian to even cupcake stores. Bet many of you also know Saveur the French restaurant, it once used to be located at the Ali Baba Eating House at the junction of East Coast Road and Joo Chiat Road! Anyway, enough of other restaurants. Today I want to just focus on my latest find, Naïve! My mother originally wanted to go to Dann’s Pescetarian Cafe for their fantastic warming fish soup but it closes early at 7pm. Since I’m the food blogger, everyone expects me to be the walking directory. I have this secret weapon called Google but if you try googling “Organic or Vegetarian restaurants in the East, Singapore”, you would probably not find anything useful. We’re really not into the vegetarian mock meats kind of thing either. 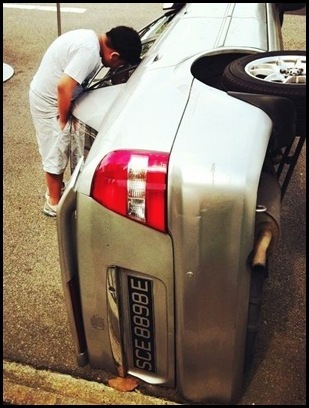 So I was really so glad when after 10 minutes of searching, I found out about Naïve. I was a little apprehensive since the review was done a few years ago. I called up and luckily the restaurant hadn’t gone kapoot! Seriously, to cut to the chase, all of us loved the food at Naïve! It’s really a shame that we haven’t chanced upon it earlier! 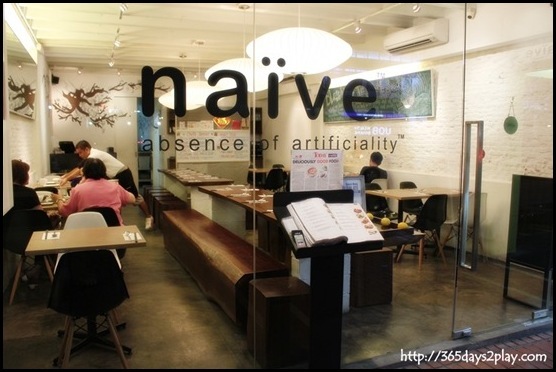 Naive does vegetarian food in Chinese Cze Char style, but in a nice modern looking type of restaurant. They also serve some Western dishes but we didn’t try any. All the Chinese dishes we tried were great! The food was tasty, not oily or greasy like alot of lousy Cze Char places are apt to be, and refreshing tasting! I totally didn’t feel like I wasn’t eating meat. I’ll put a disclaimer up front though, I am more used to not eating meat than the average person because my father is a pescetarian. 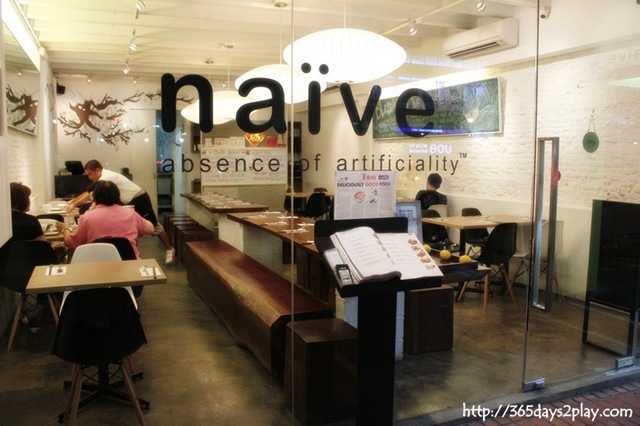 But I would think that if you’re keen to try out cze char dishes without meat, Naïve is certainly a good restaurant to do so. I think brown rice has suffered from a bad reputation for quite a long time. I recall 10 to 20 years ago, the only type of brown rice one could get in Singapore would be the rather reddish kind. 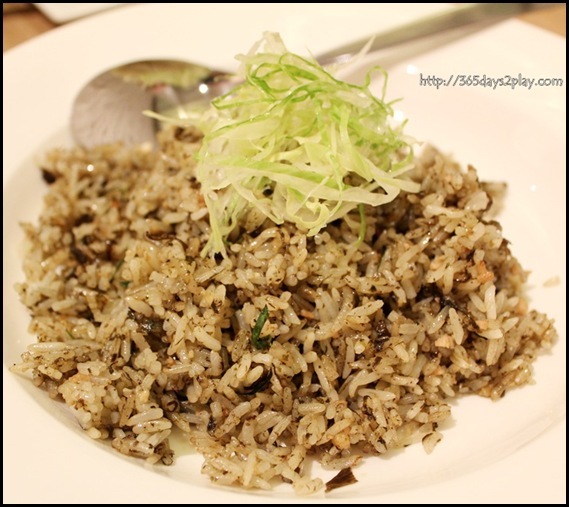 It had a very rough texture and of course when compared to white rice, wasn’t as nice to eat. 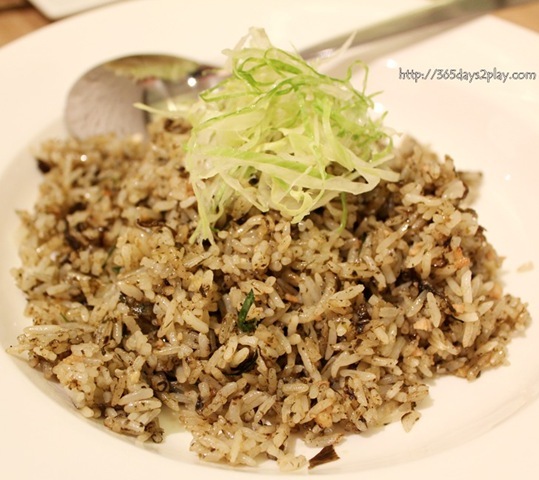 These days, there are quite a variety of brown rice available to the consumer. Seriously, if I hadn’t told you so, would you have noticed that this above was brown rice? This dish tasted like olive fried rice. Tasty and fragrant! This tofu cake was fried to a crisp, and was a delight to eat. 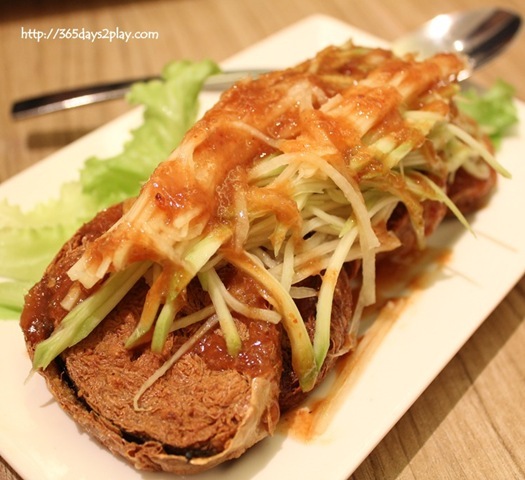 It was very crispy on the outside, and a little bouncy on the inside as it’s made of folds and folds of Tau Kee. The green shreds above are mango in sweet and sour sauce, which added a tanginess to the tofu. Very delicious. Did you manage to see the “half car” at Expo? It was crazy! 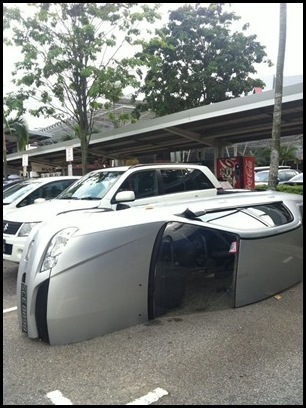 I wonder what happened, if only I had an in-car camera, it would have come in useful! Check out the video at http://bit.ly/ViN3Sm and you might find out why…. Hope the torrential rain didn’t wash the car away….